Fullfilling the requirements of executor is never an easy task. The following is a list of much of what is required in settling an estate. Determine immediate cash requirements of the family. List contents of safety deposit box. Arrange for safe custody of personal valuables. Review adequacy of property insurance coverage and alter if necessary. Locate the Will ascertain the whereabouts of beneficiaries. If deceased lived in a rental property, terminate lease or arrange sublet. Cancel drivers license, magazine and newspaper subscriptions, utilities and club memberships. Confirm outstanding balances and cancel credit cards. Request Canada Post to reroute mail. Complete or cancel outstanding brokers orders. Ascertain assets and liabilities by writing to financial institutions, insurance companies, brokers, employers, and RRSP/RRIF trusties. Obtain prior years tax returns. Prepare and file any T1 returns for previous years within six months of the date of death. Locate and obtain title documents for real property, mortgages, share certificates, bonds, debentures, and guaranteed investments certificates. Arrange evaluations of real estates, securities, personal property and automobiles. Arrange for revue of the investment portfolio. Send a copy of the Will to each residuary beneficiary. Notify legates/devisees of benefit to be received under the Will. Prepare inventory of assets and liability. List assets by class, their value and full particulars thereof including certificate number, registration particulars, maturity date, interest rate, payment frequency and dates. Retain and meet with estate solicitor to complete application for probate. Make provisions for any fees that may be applicable. When probate is granted, obtain sufficient notaries copies to transfer assets. Report to beneficiaries on progress of administration and provide each residuary beneficiary with a copy of the inventory of assets and liabilities. Arrange for publication of advertisement for Creditors and others prior to distribution. 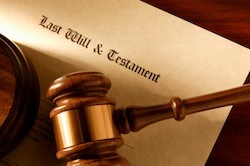 Ask estate solicitor to register probate on title to real estate if necessary. Settle all claims and debts. Complete declaration of transmission and powers of attorney required to transfer securities. Close bank accounts and transfer balance to estate bank account. In the case of joint accounts, provide the financial institution with the death certificate and request transfer to surviving joint tenant. Review Will and distribution of assets. Consult with beneficiaries regarding specific distribution. (Distribution in kind) where appropriate. Initiate re-registrations and transfer of securities, or arrange for sale of securities if converting to cash. Prepare cheques for payment of debts, legacies, interim distributions. Arrange rollover to transfer RRSP / RRIF proceeds. Prepare and file necessary tax return for foreign assets, if any. Prepare any file terminal T1 Tax returns and other returns with Revenue Canada and request Clearance Certificate. Terminal period returns must be filed by April 30th of the year following the year of death, or by six months from the date of death, whichever is later. If the Will provides for the outright distribution, transfer assets or funds to beneficiaries. Retain sufficient funds as a reserve for income tax and any outstanding accounts. If the Will provides for trusts, set up testamentary trust and arrange for ongoing review of the investments. Prepare and file T3 Trust Information Return. The first T3 return must be filed within 90 days from the year end of the taxation year which the estate has chosen. Prepare accounts for passing or approval by beneficiaries. Ask estate solicitor to prepare release. Write the beneficiaries with the accounting and request approval. If beneficiaries approve accounts, confirm all releases received. If accounts are to be audited by the court, ask the estate solicitor to prepare the application and all necessary notices and to arrange an appointment. Distribute any remaining funds or deliver assets. Arrange for closing the estate bank account after confirming all cheques have cleared. Write to the beneficiaries with the final report on all aspects of the administration.